In the UK, Digital Champions are at the center of One Digital and are delivering sustainable digital skills to people right across society. The Digital Champions Network (DCN) is a unique and comprehensive online platform that provides Digital Champion training and a support community for people who go through that training. Shared with housing providers, local authorities and other regional and national organisations it is successfully turning hundreds of volunteers into Digital Champions who can provide effective digital skills support. With courses, resources and forums specifically designed to develop the critical skills needed for a successful Digital Champion, the DCN is a unique and low-cost way to help people to get and stay online.The Digital Champions Network (DCN) is a supported online solution to create, train and support Digital Champions in your community. Click on the image below to view the info-graphic. What are Basic Digital Skills? Basic Digital Skills have been defined by digital skills charity Go ON UK in consultation with a range of expert organisations. Basic Digital Skills empower the individual to use digital technologies to: manage information; communicate; transact; problem solve, and, create. Why is it important to have Basic Digital Skills? Today’s world is a digital world and those without the skills to participate in it are disadvantaged. Over 12 million people (around 1 in 5 UK adults) don’t have basic digital skills (Go ON) and as a result they have less opportunity to realise the individual, social, economic and health related benefits that having digital skills provides. Having more opportunities to pursue hobbies. What is a Digital Champion? Digital Champions are people, such as staff, volunteers, friends and family members, who already interact with those who need better digital skills. Digital Champions are not technical wizards but have passion and confidence with using digital technology and a willingness to help others. What difference can a Digital Champion make to helping people online? When there is an existing relationship between a potential Digital Champion and an end beneficiary, there is an opportunity to add digital skills support into it. That digital skills support – whether it is signposting, advice or hands on tuition – is much more impactful because it is relevant and personalised for that engaged individual. Digital Champions can also provide accessible and regular support, giving that long term help that many internet beginners need. This One Digital infographic shows exactly how Digital Champions can make a difference. 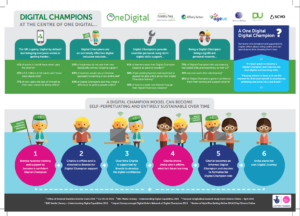 How are the Digital Champions being trained and supported? If you would like to know more about the One Digital programme and its partners please contact Emma Weston, One Digital Programme Director and Chief Executive of Digital Unite at [email protected]. If you are interested in becoming a Digital Champion please email [email protected] or call 0800 228 9272. For all media enquiries about One Digital please contact Katharine Teed, Communications Manager at Digital Unite [email protected] / 0800 228 9272. Posted in Digital Inclusion, Europe, NGO/NonprofitLeave a Comment on In the UK, Digital Champions are at the center of One Digital and are delivering sustainable digital skills to people right across society. Spring Online: A Great Opportunity to bridge the Digital Divide! Social housing providers are being urged to engage in “one of the nation’s biggest digital inclusion campaigns”. The Government-backed Spring Online with Silver Surfers’ Day – delivered by Digital Unite in partnership with UK Online Centres and Race Online 2012 – is one of the biggest campaigns each year to give older people and less confident users a taste of computers and the internet. The campaign – which has been going for 11 years – has helped more than 150,000 people get more out of life online. Social housing providers are being urged to play their part to help residents get a taste of computers and the internet during Spring Online from 23-27 April. Digital Unite’s mission is to promote and explain the benefits of technology. They have been in operation since 1996 and currently offer an online community and free online content to help those new to the internet learn more about its incredible applications. Posted in Digital Inclusion, Digital Literacy, EuropeLeave a Comment on Spring Online: A Great Opportunity to bridge the Digital Divide! The United Kingdom shares a similar demographic distribution to the United States in regards to Senior Citizens and digital inclusion. One way a group of NGOs are trying to bridge the digital divide is through their program called the Digital Inclusion Network. This group, founded in 2006, consists of more than 200 member organizations that provides computer and Internet training to Senior Citizens. Member NGOs sign an MOU and participate in this network by sharing best practices and local information and receive start-up support including toolkit, learning materials and resources, and opportunities to network and create partnerships. This partnership organization is managed by AgeUK, an organization that provides information spanning financial advice and health advice, to public policy research and funding regarding Senior Citizens. 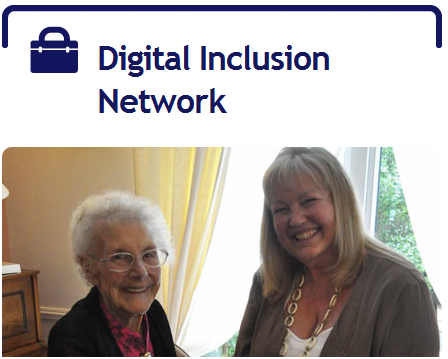 The Digital Inclusion Network is a fine example of networking local NGOs which know its constituents best, to best serve and address issues involving digital inclusion. The EU Agency ENISA, the (European Network and Information Security Agency) has launched a new report on cyber bullying and online grooming (preparing sexual abuse); warning that misuse of data (data mining and profiling) harms minors. The report identifies the top emerging risks and makes 18 non-technical recommendations for their mitigation. One key recommendation is to strengthen Member State’s law enforcement agencies. Other recommendations point to safeguards adapted to the needs of youth’s cyber activities. Digital devices and the internet now play a significant role in children’s lives. Today’s young people live their online lives in both private and educational settings. This is an environment radically different from that of their parents, in their childhoods. Risks in a child’s online environment can be detrimental to their physical activities and social skills, argues the ENISA Expert Group on Internet risks. The report details a scenario of 13-year old Kristie’s changed behavior, poor grades and negative attitudes due to abuse in her online life. Many parents lose control, as they lack knowledge and tools to support their children, the report argues. The Agency thus issues 18 recommendations to mitigate identified risks. Adoption of a document relevant for the future of all EU citizens – “Gdansk Roadmap for Digital Inclusion” – concluded the “Innovation for Digital Inclusion” conference in Gdansk, Poland. It’s participants drafted the “Roadmap” in order to indicate to the European Commission the priority actions to be taken in the immediate future. Carrying out of these actions may speed up the process of digital inclusion for 150 millions Europeans who are thus far excluded, and deliver a new and much needed impetus for EU’s economies struggling to overcome the current crisis. Importance of the document was underlined by Neelie Kroes, Vice President of the European Commision responsible for Digital Agenda, herself present in Gdańsk. “Our document provides inspiration to all sides actively promoting e-inclusion, outlining strategies and concepts combating digital divide and defining European inclusion policies,” stated Krzysztof Głomb, the president of “Cities on Internet” Association, at the document’s unveiling. The initiator and co-organizer of the Gdańsk conference stresses that authors of the document paid particular attention to the value of digital education. “This corresponds with the opinion by the European Economic and Social Committee prepared and adopted in mid July of this year. According to the Committee, access to infrastructure and tools should be considered as a fundamental right, but without the education e-inclusion of digitally illiterate Europeans will not be accomplished,” Krzysztof Głomb adds. In Belgrade, Serbia, there was an unusual event which took place for grandparents and their grandchildren. The event was organized by local NGO IAN (International Aid Network). Teams were formed, and consisted of a grandparent who was older than 55, together with their grandchild who was younger than 13. Teams who had previously passed the qualifications had the task to efficiently and as accurately as possible provide numerous / various answers to interesting questions in an online quiz whilst using the internet to search for necessary information. The contestants showed that grandchildren can play an important role in bridging the digital divide which exists between generations, by teaching their grandparents about the computers as well as the internet.